Pneumonia versus bronchitis — what is the difference?Although pneumonia and bronchitis are both lung disorders that have similar causes and symptoms, it is important to know the difference between the two to get the appropriate treatment. Learn more about these illnesses, their causes and available treatment options. Coughing, shortness of breath and fatigue are common with any disorder of the lungs, especially bronchitis. Other symptoms of bronchitis include a nagging cough that refuses to go away and the production of clear, white or yellow mucus. Bronchitis can turn into pneumonia if left untreated. Symptoms that persist for longer than three weeks usually require immediate medical treatment. According to the American Lung Association, about one third of pneumonia cases are caused by viruses. Pneumonia can be linked to bacteria, fungi and viruses, and is common amongst the elderly and individuals with weakened immune systems. Unlike bronchitis, which typically goes away on its own, pneumonia usually requires immediate treatment from a medical professional. Bronchitis is typically caused by a viral or bacterial infection, but can also be caused by inhaling certain irritants, including air pollution, cigarette smoke and toxic chemicals. According to Mayo Clinic, “ Repeated bouts of bronchitis may indicate that you’re developing chronic obstructive pulmonary disease (COPD).” Therefore, it is imperative that you see a medical professional immediately if your symptoms do not go away after several weeks. 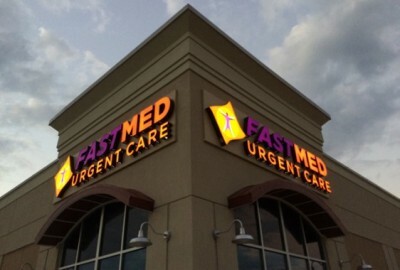 FastMed Urgent Care provides non-emergency treatment of illnesses like bronchitis and pneumonia. With nighttime, weekend and holiday hours, we offer the convenience of the ER without the long waits and crowded waiting areas. FastMed is also affordable. We offer a self-pay discount program and accept most major insurance providers, including Medicare and Medicaid. Find a FastMed near you today! Click here to hear from one of our satisfied patients, Like us on Facebook, or Follow us on Twitter.